If you’re looking to get lucky with some throwback dance hits, we’ve got great news for you. 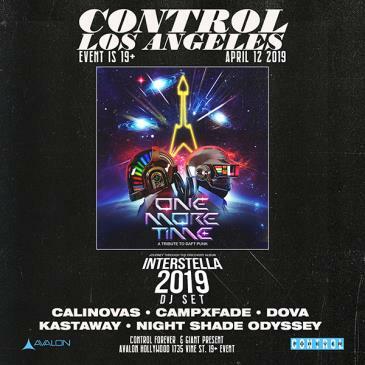 Control Friday is making its return to AVALON Hollywood on April 12th with One More Time: A Daft Punk Tribute, featuring local support acts CaliNovas, CAMPXFADE, Dova, Kastaway, and Night Shade Odyssey. One More Time - made up of Ben Linsenmeyer and Ron Diep - is recreating Daft Punk’s iconic 2006-2007 world tour and sparing no expense in the process. Armed with full replica Daft Punk costumes and a mastery of their discography, One More Time has established itself as the only realistic tribute band of its kind. Since joining forces at a college party in 2010, the duo has spent the better part of a decade bringing their act to stages across the world. One More Time will be joined by DJ, producer and AVALON house favorite CaliNovas, coming in with hardstyle bass drops and the hottest new tracks. Control Friday also welcomes back a pair of deep house duo’s. CAMPXFADE complements Daft Punk’s 2000’s sound with lo-fi beats and crazy samples, and Kastaway will be setting the vibe with an underground techno set. Also, locals Night Shade Odyssey are bringing some classic drum and bass sounds to the mix, a perfect way to ensure some heavy hitting, yet smooth, bass music. Dova takes us away with beautifully mixed hip-hop samples over electro house beats. Make sure to grab your tickets for April 12th to watch the wonders of One More Time, CaliNovas, CAMPXFADE, Dova, Kastaway, and Night Shade Odyssey at AVALON Hollywood!